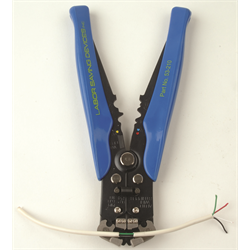 The EasyStripper Self Adjusting Wire Stripper is a multifunctional wire stripping tool to make wire stripping fast and easy. It can strip stranded or solid core wire from 10-26 gauge with one squeeze of the handles. There are connector crimping and wire cutting capabilities built into the handle of the high quality construction tool.